Crashed three miles NW of Mildenhall, Suffolk after the pilot abandoned the aircraft following loss of control. Swung into an obstruction after an undercarriage leg collapsed on landing at Chivenor, Devon. Although bad weather had been forecast the aircraft still took off together from West Raynham, Norfolk. After encountering the weather they attempted to divert to Marham but were unable to locate the runway due to fog. Four aircraft ran out of fuel, the pilots ejecting near Swaffham. WW635 flew into the ground killing the pilot. WW603 did make a final approach but ran out of fuel and belly landed short of the airfield. Collided over Portmahomack, Ross and Cromarty One aircraft crashed at Petley Farm, the other at Rockfield farm. Both pilots ejected. Ditched into Lough Foyle off Eglinton, Londonderry, Northern Ireland after loss of power. Crashed into the Gulf of Aden and exploded after the engine caught fire on take off from HMS Centaur. The pilot was killed. Crashed into the sea off Northern Ireland while operating off HMS Bulwark. Belly landed into a paddy field after an engine ran away on take off from Tan Son Nhut, Vietnam. The undercarriage was retracted in error while taxying at Sylt, West Germany. Crashed near Blandford, Dorset after the pilot ejected following engine failure. Dived into the ground near Stilton, Huntingdon killing both crew, after the tailplane actuator malfunctioned. Crashed at Zurrieg and burnt out after take off from Luqa, Malta. The aircraft had been issued with a temporary military serial for use on trooping flights. See also 11/03/1952. Flipped over and spun into the ground from 300 ft during a stream landing at Ford, Sussex. The aircraft then exploded killing the pilot. The undercarriage collapsed while taxying at Spitalgate, Lincolnshire. Collided while in formation over Tuxford, Notts. WV485 crashed killing the pilot while WV559 landed safely and was repaired. Dived into the ground out of cloud at Shaugh Prior, Devon after the engine cut. The pilot was killed. Hit trees during a supply drop over the jungle in Malaya. Seven on board were killed. Swung on landing in a heavy crosswind at Leconfield, Yorkshire causing the undercarriage to collapse. Hit trees on rising ground in bad visibility near Watlington, Oxon while on approach to Benson. Both crew were killed. An engine feathered due to loss of oil pressure. It flew into trees at Dahlhausen, West Germany killing two of the crew. Sank back into the trees on take off from Paddy's Ladang, Malaya and overturned. Swung on landing at Seletar, Singapore causing the undercarriage to collapse. The crew ejected over Newark, Notts after the elevator controls failed. Burnt out at Bruggen, West Germany after the hose from the refuelling bowser split causing fuel to spill onto the still hot engine. Suffered severe damage during barrier trials at RAE Bedford. Allocated to A2414. Took off from Wattisham for a night cross country sortie, nothing more was heard. The pilot had apparently intended to carry out an unauthorised flight over a lighthouse in the Thames Estuary and then fly up the coast. It is possible that he flew into the sea. Went missing on a night intercept sortie from HMS Ark Royal while operating in the Mediterranean Sea off Philippeville, Algeria. Both crew were missing presumed killed. Turned to starboard immediately after a night take off from HMS Ark Royal while operating in the Mediterranean Sea. The angle of bank increased and it dived into the sea off the starboard bow killing the three crew. Both engines cut while in the circuit at Colerne, Wiltshire. It hit trees during an emergency landing and burnt out killing both crew. Force-landed and hit a fence after the engine cut during an overshoot at Paroi, Malaya. Blown off the taxiway by a gust of wind at Wick, Caithness and ran into a hole. Written off after landing at Celle, West Germany after the gun doors had detached in flight and hit a wing. Suffered port engine failure at 50 ft on take off from Filton, Bristol due to compressor blade failure. Force landed wheels up at Cribbs Causway and struck an oak tree which tore off the port wing, undercarriage and elevators, leaving the remainder of the airframe severely damaged. The crew escaped unhurt. Later broken up at Colerne. This aircraft had gained the world height record on two occasions. That of 63,668 ft on 04th May 1953 and 65,876 ft on 29th August 1955. Crashed into the North Sea during a night bombing run on Eglington range Yorkshire. Belly landed at Celle, West Germany after the undercarriage jammed. Badly damaged during barrier trials at RAE Bedford. Allocated to ground instruction. Undershot on landing at Thorney Island, Sussex and lost its undercarriage. Ditched into rough seas off Brawdy, Pembrokeshire during a GCA landing, possibly due to carburettor icing. The pilot was killed but the cadet passenger was rescued from his dinghy by helicopter. Belly landed at Tangmere, Sussex after the undercarriage collapsed during a roller landing. Hit by a down draught from rising ground and flew into trees 23 miles east of Ipoh, Malaya. Whilst taking part in Exercise Sea Dragon the aicraft flew into hills near Sek Kong, Hong Kong while climbing out of a valley. The pilot was killed. Crashed near Wattisham, Suffolk after the ejector seat malfunctioned and ejected the pilot involuntarily. Force-landed in a field near Thornaby, North Yorkshire after the engine cut on take off. During a sortie from HMS Centaur both aircraft flew into Devils Peak, New Territories, Hong Kong which was obscured by low lying cloud. They both exploded on impact killing the pilots. Crashed near South Cerney, Gloucestershire after the engine failed and caught fire. Declared a write off after overshooting on landing at Waterbeach, Cambs. N.B. The date is when it was struck of charge, which may differ from the date of the incident. Collided over the Mediterranean Sea off Akrotiri, Cyprus. WB176 crashed into the sea after the crew baled out. WH569 belly landed at Akrotiri and burnt out. Broke up and burnt out killing the pilot during an emergency landing at Takali, Malta following engine failure. Bounced on landing at Middle Wallop, Hampshire and overturned. Swung on landing at Woodvale, Lancashire causing the undercarriage to collapse. Caught fire and dived into the ground near Middleton St. George, Durham, killing the pilot. Caught fire after the undercarriage collapsed on landing at Ataq, Aden. Swung into a ditch during a forced landing on a road at Seqa, Malaya after the engine cut. Stalled on approach to Chivenor, Devon and crashed into the river Taw killing the pilot. Flew into the ground while in the circuit at Middleton St George, Durham killing both crew. Crashed at Down Holland, Lancashire during a turn killing the pilot. Hit ground equipment while taxying at Honington, Suffolk. Flew into the ground immediately after a night take off from West Malling, Kent. Both crew were killed. The pilot was unable to lower the undercarriage on return to Tengah, Singapore from an anti-terrorism mission. While circling the airfield and using various methods in an attempt to lower the undercarriage the aircraft suffered a flameout. Although the landing was a smooth wheels up the aircraft was classified as beyond repair and scrapped. Crashed at Colne Engaine, Essex after the pilot ejected due to engine failure. He separated from his harness and was killed. Dived into the ground at Wilmington, Kent after take off from Biggin Hill. The pilot was killed. No cause was found. The pilot ejected after loss of power while in the circuit at Leuchars, Fife. The ventral tank hit the runway during an overshoot at Leuchars, Fife. Landed safely but declared a write off. Crashed into a mountain seven mile SSW of Conway, Caenarvon killing the pilot. Crashed near Selby, Yorks after loss of control. The pilot baled out but was killed. Belly landed at Tengah, Singapore after the undercarriage jammed. Overshot on landing at Exeter, Devon after the pilot approached too fast with full flaps in gusty conditions. During a slow roll at 20,000 ft and while inverted the seat was felt to move. There was then a loud bang and the pilot found himself in free air still in his seat. He parachuted to safety but was injured. The aircraft crashed at Summers Pace north of Billingshurst, Sussex. Lost power after take off from Celle, West Germany and crash-landed. Written off in a hangar accident at Ford, Sussex. Allocated to A2435. Crashed two miles east of Odiham, Hants after the pilot ejected following engine failure. Dived into the ground at night after loss of control on take off from Oakington, Cambs. The pilot was killed. Stalled and crashed while in the circuit at Driffield, Yorks. Both crew were killed. The undercarriage collapsed during take off from Turnhouse, West Lothian causing it to swing off the runway. Stalled in a turn and crashed at Aswell, Hertfordshire. Belly landed on the beach after the engine cut on approach to Valley, Anglesey. The port wing hit the water and the aircraft cartwheeled the sea three miles south of Shoreham, Sussex during low altitude altimeter trials after the tail plane actuator failed. Both crew were killed. Sank back onto the runway on take off from Fassberg, West Germany causing the undercarriage to collapse. Struck the sea wall while on finals to Thorney Island, Sussex, lost the starboard undercarriage and crashed onto the runway. Later declared a write off. Overstressed while taking avoiding action during a practice interception at 34,000ft causing the pilot to black out. He came round at 20,000ft and regained control. Returned to Geilenkirchen, West Germany but was declared a write off. Suffered a major electrical failure at low level and high speed south of Farnborough. The pilot attempted a crash landing near Southwick, Sussex but the aircraft exploded when it hit the ground. Of the four crew only the copilot survived when he ejected moments before the aircraft struck the ground. Five civilians were also injured. The engine failed due to debris damage during gun firing. A forced wheels up landing was made on the grass at Hucknall, Nottinghamshire due to lack of hydraulic pressure. The pilot escaped without injury. Landed in the undershoot area at Waterbeach, Cambs. It bounced then belly landed. During a paired take off from Sek Kong, Hong Kong WK423 sank back onto the runway and belly landed. WK412 stalled trying to avoid it and crashed, killing the pilot. Struck a cottage during a GCA approach to Brawdy, Pembrokeshire killing the pilot. The brakes failed on landing at Linton On Ouse, Yorks. It ran off the runway and into a building. Tipped up onto its nose avoiding a collision while taxying at Middle Wallop, Hampshire. Stalled and spun into the ground on Aberdeen Island, Hong Kong. The pilot was killed. Crashed near Ipoh, Malaya after control was lost in bad weather. Tipped up onto its nose on landing at Middle Wallop, Hampshire. Force-landed into a swamp near Ipoh, Malaya after the engine cut. Dived into the ground while orbiting the airfield at Brawdy. Pembrokeshire. The pilot was killed. Possibly caused by the disengagement of one of the powered ailerons. Sank back onto the runway on take off from Wahn, West Germany and overshot. Made a forced landing onto the Helston to Falmouth road, Cornwall after engine failure. Stalled on take off from Idris, Libya and burnt out killing the pilot. During deck landing trials on HMS Bulwark it climbed steeply after launch, turned to starboard and struck the sea inverted. Crashed into the Mediterranean Sea off Delimara Point, Malta killing the pilot during a radar calibration exercise with HMS Jamaica. Possibly caused by anoxia after the pilot turned off his oxygen. The wreck was recovered by HMS Jamica. The brakes failed on landing at Langar, Nottinghamshire and it ran into a ditch. Lost power on approach to Church Fenton, Yorks and force-landed. Stalled during deck landing trials on HMS Bulwark. It crashed into the sea after a wing hit the stern of the ship. Both crew were killed. Crash-landed into fields after the engine cut on take off from Coltishall, Norfolk. The pilot allowed the aircraft to sink below 50ft during a practice strike and struck a tall tree. It returned to West Raynham, Norfolk. but was declared a write off. Crashed near Littleport, Cambs after the pilot ejected following loss of control during practice aerobatics. Hit trees during a reconnaissance flight and crashed into the jungle near Kuala Pilah, Malaya. The three crew were killed. Swung on take off from Culdrose, Cornwall causing the undercarriage to collapse. Crashed near Amman, Jordan after the pilot ejected following engine failure. Flew into the ground during a night approach to Odiham, Hants. Both crew were killed. Blown off course by a gust of wind at Hawkinge, Kent. It hit power cables and landed on the roof of a house. Due to the inexperience of the pilot the aircraft broke out of the catapult while being prepared for launch from HMS Bulwark. It travelled along the deck and fell into the sea. The pilot was rescued. Stalled during a practice forced landing at Alkborough, Lincolnshire and cartwheeled. Stalled during a supply drop over the Malayan jungle and dived into a hill. The nine crew were killed. Undershot on landing at Noble Field, Malaya and lost its undercarriage. Undershot on landing at Takali, Malta causing the undercarriage to collapse. Crashed into the sea fifteen miles off Lossiemouth, Morayshire while on a test flight. The pilot ejected and parachuted into the sea but was killed. Lost its propeller on take off from St Athan, Glamorgan. It force-landed into a field and hit a hedge. Declared a write off on landing at Amman, Jordan after the gun door detached in flight hitting a wing. Ran onto the grass after landing at Boscombe Down, Wiltshire. The nosewheel broke off causing the main rotor to strike the ground and the aircraft to roll onto its side breaking off the tail cone. The pilot escaped safely. Lost power on take off from Pembrey, Carmarthen and crash-landed. Crashed into Holyhead Harbour, Anglesey after the pilot ejected following engine failure. Crashed at Chilbolton, Hampshire after the engine failed to relight following a deliberate shut down. The pilot ejected safely at 2,800ft this being his second ejection from a Swift. Ditched into the North Sea off North Coates after the engine lost power during a winching exercise. Ditched into the sea near Speira Harbour, Italy seventeen minutes after WM968 below, also after running out of fuel during bad weather and language problems with Pisa ATC while operating off HMS Eagle. Both aircraft were briefed to land at Pisa airfield but the US authorities had not informed the airfield of their intended arrival. Ditched into Genoa Harbour, Italy after running out of fuel due to bad weather and language problems with the ATC at Pisa. It was operating off HMS Eagle. See WM917 above. The port undercarriage collapsed on landing at Culdrose, Cornwall. Ditched into the sea off Italy after a catapult launch from HMS Eagle. The undercarriage collapsed on landing near Dilwyn, Herefordshire. Damaged beyond repair on landing near Bulford Camp, Wiltshire. Dived into the ground south of Scunthorpe, Lincs after control was lost in cloud. The pilot was killed. The pilot baled out near Bonn, West Germany after the canopy came off during a dive and the aircraft began to break up. Stalled on approach to Fassberg, West Germany and crashed killing the pilot. A wing hit the ground after hitting a slipstream on approach to North Weald, Essex. Overshot but crashed on second approach after the ailerons jammed. Crashed during a night mirror landings at Hal Far, Malta. Belly landed at Nicosia, Cyprus after the undercarriage jammed. Suffered a sudden loss of power due to a fuel leak and force landed on rough ground two miles north of Tidworth, Wiltshire. The rotor blades struck the ground and the tail rotor was torn off when the aircraft rolled onto its port side. Both crew escaped safely. Written off when the engine caught fire on start up at Amman, Jordan. Damaged in a flying accident in West Germany. Later declared a write off and sent to 71 MU at Bicester. During a paired take off from Filton, Gloucs the lead aircraft lifted off too early causing it to swing and strike the runway. VV661 took avoiding action and both aircraft abandoned take off. The aircraft then ran through the boundary fence after the brakes failed. Ditched into the North Sea next to the Bell Rock Lighthouse, off Middlesborough, after engine failure. Crashed at Bircham Newton, Norfolk. The pilot carried out an unauthorised flapless landing in difficult weather conditions at Takali, Malta. He was unable to stop and ran through the perimeter fence and ran across some rough ground. Made a wheels up landing onto a mudbank near Bowness, Cumberland after engine failure. The pilot ejected NE of Xeros, Cyprus after a fire warning and loss of power. The nose wheel collapsed on landing at Sylt, West Germany starting a fire. Ditched into the Mediterranean off Hal Far, Malta after engine failure, operating off HMS Eagle. Stalled on approach to Honiley, Warwickshire. It crashed 150 yards short of the runway, killing a civilian on the road. Crashed east of Filey, Yorkshire after the pilot ejected following engine failure. Hit a strand of wire across the strip on landing at Limni Camp, Cyprus and overturned. Overshot during a single engine landing at Culdrose, Cornwall. It ran into a building and a stationary Dragonfly HAR3, WP493. Ditched into Mounts Bay off Porthleven, Cornwall after engine failure. Belly landed after the engine cut while in the circuit at Kinloss, Morayshire. Flew into high ground at Chanctonbury Ring on Sussex Downs during a GCA to Ford, West Sussex in low cloud. The pilot did not eject and was killed. Hit a fence while taking off down wind at Barnard Castle, County Durham and crashed into a ditch. Following an earlier engine explosion, one engine failed and power was lost on the other while on approach to Wyton, Cambs. It crashed at Woodhurst. Broke up in the air and dived into the sea off Yen Kedah, Malaya killing the pilot. Overshot on landing at Takali, Malta and hit a wall. After touch down at Swinderby, Lincs the aircraft continued down the runway in a tail down attitude. It then climbed steeply and side slipped into the ground, cartwheeled and caught fire. Possibly caused by a spanner found in the port boom, wedging the elevator control. The pilot was killed. Crashed off the end of the runway at Culdrose, Cornwall after the pilot raised the undercarriage, trying to avoid an overshoot. Both tailplanes detached while at 590 knots due to the onset of symmetric flutter caused by low rotational stiffness in the tailplane control circuit. The pilot ejected after some difficulty and the aircraft crashed near Shipton Bellinger, Hants. This was a company demonstration aircraft and did not carry a military registration. Collided during the take off run at Akrotiri, Cyprus. WB180 overshot and was written off while WB172 was only slightly damaged. Overshot on landing at Mahfid, Aden causing the undercarriage to collapse. Struck the runway and exploded during a display at Brawdy Air Show, Pembrokeshire. The pilot was killed. The pilot retracted the undercarriage to stop after the engine surged on take off from Culdrose, Cornwall. Force-landed into a swamp at Taiping, Malaya after the engine cut. Crashed after a wing hit the ground on take off from Butterworth, Malaya. Crashed five mile SW of Wunstorf, West Germany after the pilot ejected following a fire warning. Force-landed into the jungle ten miles north of Kroh, Malaya after the engine cut. Crashed into Dornoch Firth during a practice bombing run on Tain range, Ross and Cromarty. Ditched into the sea off Gibraltar after attempting an emergency landing with the undercarriage jammed up. Operating off HMS Bulwark. The aircraft had almost recovered from a steep high speed dive when the starboard wing dropped and it dived into the ground at Empel, West Germany. It exploded on impact killing the three crew. Flew into the ground during a night overshoot at Stradishall, Suffolk. Crashed near Fakenham, Norfolk after the pilot ejected following loss of power on approach to West Raynham. The pilot was unable to lower the main undercarriage while operating off HMS Eagle. He diverted to Hal far, Malta but was unable to lower the undercarriage with the emergency hand pump due to a leak in the hydraulic system. It landed with only the nose wheel down and this collapsed causing the aircraft to slew off the runway. The pilot ejected just after take off from Bruggen, West Germany after engine failure. Dived into the Mediterranean from a formation joining the landing circuit for HMS Eagle. Belly landed in error at Seletar, Singapore. Overshot on take off from Takali, Malta after the throttle jammed. After recovering from a loop during a tail chase the pilot found that he was very close to the ground with a railway viaduct on one side, HT cables on the other and a hill in front. He pulled up sharply, stalled and crashed at Hurstbourne, Hamshire. Undershot the runway and hit a hedge at Graveley, Cambs after the engine failed to respond during an overshoot. Abandoned take off from Butterworth, Malaya and ran into the sea after the canopy came off. Crashed at Bala, Merioneth, Wales after the pilot was overcome by anoxia. Belly landed at Waterbeach, Cambs in error. Burnt out after the ventral tank exploded. Stalled on approach to Spitalgate, Lincs and dived into the ground. Written off in a flying accident at Hornchurch, East London. The pilot ejected after control was lost in a cloud. It crashed near North Weald, Essex. Dived into the ground south of Peterborough, Cambs after loss of control in a spin. Crashed through the boundary fence and ran into a cow shed after the starboard engine failed on take off from St. Davids, Pembrokeshire. Became overdue at night between Tain Range and Milltown. A search by Shackleton through the night found nothing. A search by a Sea Hawk in the morning found an oil slick. It had crashed into the sea six miles east of Lossiemouth, Morayshire killing the pilot. Ditched into the Mediterranean after it caught fire on launch from HMS Eagle. Ditched into the sea after an engine cut while on approach to the Car Nicobar Islands, Malaya. Damaged by debris during a rocket attack on Fassberg range, West Germany. Landed safely but declared a write off. Crash-landed at Ipoh, Malaya after the tail rotor drive failed. Belly landed into a field five mile SW of Cambridge after the engine failed. Belly landed and burnt out at Leuchars, Fife after the undercarriage jammed. Lost height during a single engine approach to Gibraltar when the undercarriage was lowered and ditched into the Mediterranean. Dived into the ground at Turnhouse, West Lothian when recovering from a loop. Lost power during a practice forced landing at Folkingham, Lincs. It overshot and hit a concrete block. The pilot ejected after the engine cut while in the circuit at Sylt, West Germany. The pilot was unable to lower the starboard undercarriage or retract the port. After an initially successful touchdown at Hatfield, Herts the aircraft spun wildly after the wing tip struck the ground. Belly landed onto the runway at Honiley, Warwickshire after engine failure. The pilot ejected over Fosdyke, Lincolnshire after loss of control during aerobatics. Swung off the runway after an undercarriage leg broke on landing at Chivenor, Devon and struck a vehicle. To 7541M. XE982 was damaged beyond repair when WL505 taxied into it on the dispersal at Cranwell, Lincs. WL505 was only slightly damaged. Lost power on take off from Kleine Brogel, Belgium. It crashed into the undershoot area while making a forced landing. Due to flaring the landing at Farnborough, Hampshire the aircraft pitched up close to the ground and control was lost. It struck the runway and bounced to destruction. The pilot escaped without injury. Suffered engine failure on approach to Strubby, Lincs. The undercarriage collapsed on landing due to insufficient hydraulic pressure to lower it fully. Not repaired and declared a write off during June 1957. Crashed at North Farm, Berwick, Oxfordshire. The pilot ejected but was killed. The port engine stalled after the pilot attempted to overshoot from a too low and slow approach to Martlesham Heath. Suffolk. Directional control was lost and the aircraft rolled inverted and dived into the ground from 200ft killing both crew. The port engine had failed to respond due to a faulty acceleration control unit which had caused severe over fuelling. Crashed after the engine failed on take off from Valley, Anglesey. The pilot was killed. Damaged when it bounced on landing at Turnhouse, West Lothian in turbulent conditions, overran the runway and came to rest in a ditch. It was not repaired and was scrapped on site. The undercarriage struck the ground while on approach to Heathrow Airport in fog. The pilot and co pilot were unable to control the aircraft and ejected. The other four crew were unable to abandon the aircraft and were killed when it hit the runway. During manhandling on board HMS Albion the brakes failed and it went over the side into the Mediterranean Sea. Ingested a bird on take off from Leuchars, Fife. The pilot aborted take off but overshot the runway onto mudflats of the river Eden. The undercarriage collapsed after landing at Odiham, Hants causing the ventral tank to catch fire. Crashed near Malta during a mission from HMS Bulwark. The pilot had ejected after a warning light came on. Crashed into Mellinka Bay, Malta while operating off HMS Albion after the pilot ejected due to a spurious fire warning. Came out of cloud in a dive during an air test. It struck the ground at Willington, Cheshire killing the pilot. Stalled and crashed during an overshoot at Cranwell, Lincolnshire killing the pilot. Hit the slipstream of another aircraft while on approach to Chivenor, Devon. It sank onto the runway, causing the undercarriage to collapse. Ran out of fuel and hit trees during a forced landing eight miles east of Barnstaple, Devon. The pilot was killed. Flew into high ground one mile NE of Mull of Kintrye, Argyll during a night anti-submarine exercise. The nine crew were killed. Struck trees and HT cables after a night take off from Driffield, Yorks. It crashed killing both crew. Flew into a mountain at night seven mile SE of Caernarvon, North Wales killing the pilot. Crashed and burnt out on take off from Pengerang, South Johore, Malaya after engine failure. Force-landed and overturned after the engine cut on take off from Segamat, Malaya. Crashed at Sidcup, Kent after the pilot baled out following engine failure. Rolled to starboard at 50ft while on approach to Abbotsinch, Glasgow and crashed onto the runway threshold. The crew escaped uninjured. Struck trees on take off and sank back into the Malayan jungle. Returned to the UK for ground instruction. The undercarriage collapsed on landing at Upavon, Wiltshire. Caught by a down-draught, force-landed and cartwheeled down a hillside four miles south of Llanfairfechan, Denbigh. Swung off the runway on landing at Ford, Sussex after the starboard undercarriage collapsed. Stalled and crashed while on approach to Amman, Jordan killing the pilot. Lost power on approach to Silloth, Cumberland and crashed into the undershoot area. Caught fire on the catapult on HMS Albion and ditched into the Mediterranean Sea ahead of the ship while operating off Hal Far, Malta. The pilot was rescued. Crashed three miles east of Kemble, Gloucs after control failure. The pilot ejected but was killed. The engine failed while on approach to Stradishall, Suffolk. It struck a hedge and caught fire, killing the pilot. Crashed at Wisbech St. Mary, Cambridgeshire. Made a wheels up down wind landing at Nicosia, Cyprus after engine problems and failure of the undercarriage. It came to rest off the runway and caught fire. Ditched into the Mediterranean Sea over the side of HMS Eagle after catapult failure on launch while operating off Malta. A wing struck the runway on landing at Kirkbride, Cumberland. It swung off the runway causing the undercarriage to collapse. Suffered a bird strike. Landed back at West Raynham, Norfolk but later declared a write off. Ran off the ship and into the sea after the arrestor wire parted on landing on HMS Bulwark. The pilot was killed. Damaged beyond repair following a wheels up landing on HMS Eagle during the Suez campaign. The undercarriage was raised to stop during take off from Honiley, Warwickshire. Listed as missing on a flight, possibly in Aden. Hit by anti aircraft fire over Gamil Bridge, west of Port Said, Egypt. The pilot glided the aircraft for three miles out to sea and ejected safely near to HMS Eagle. The engine exploded while on air support operations for paratroop landings on Gamil airfield, Egypt. The pilot ejected safely. Hit by flak causing the fuel tank to catch fire while on operations off HMS Eagle during the Suez campaign in the Port Said area of Egypt. The pilot shut down the starboard engine after a suspected fire. The aircraft yawed during an asymmetric approach to Nicosia, Cyprus and crashed short of the runway. The three crew were killed. Shot down by a Syrian Air Force MiG-17 while on a reconnaissance mission off the Syrian coast during the Suez crisis. One crew member was killed. Belly landed on a beach and caught fire after the engine had failed on take off from Dyce, Aberdeen. Crashed during operations off Port Said, Egypt after the engine was hit by flak. It was operating off HMS Albion. Damaged beyond repair when an EOKA time bomb exploded at Nicosia, Cyprus. The Iraqi pilot lost control in cloud and ejected. He landed in the sea near Lundy Island in the Bristol Channel. Although he inflated his Mae West and dinghy he did not inflate his exposure suit. His body was found close to the dinghy but not attached to it. It was concluded that he had been thrown out in the heavy swell. Crashed into the Malayan jungle and burnt out. An undercarriage leg collapsed during take off from Acklington, Northumberland. The hook pulled out on landing on HMS Bulwark. The pilot attempted to stop but the aircraft struck parked Sea Hawk WM985 before running over the side into the sea. The pilot was rescued. Crashed near Easingwold, North Yorkshire after the pilot ejected following control failure. Probably due to icing up of the controls at high altitude. The port armament/wireless access panel opened during take off from Butterworth, Malaya. The pilot raised the undercarriage to prevent the aircraft running into the sea. Crashed at night 15 miles SW of Aachen, West Germany after the pilot ejected following engine failure. Both damaged beyond repair on the hangar deck of HMS Eagle after the guns of Sea Venom WW193 were fired accidentally. Sea Venom WW270 was also damaged. The ship was in the Middle East at the time. 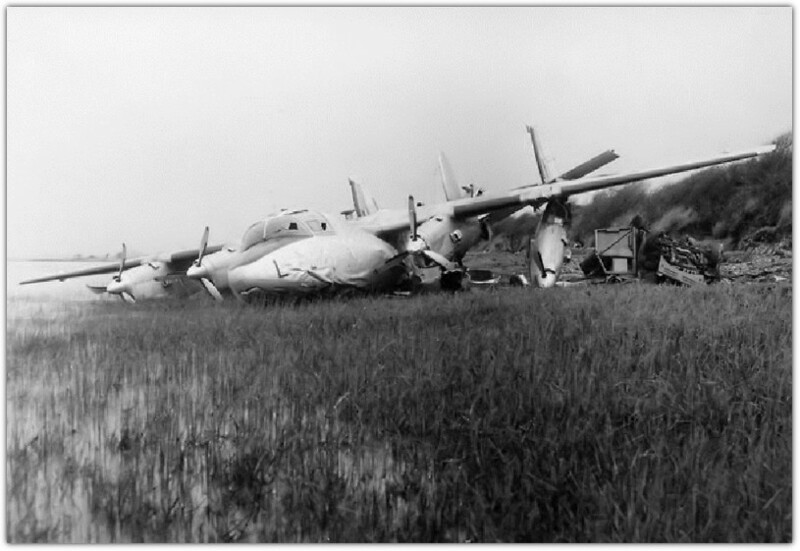 Crash-landed at Schleswigland, West Germany after an engine cut and an undercarriage leg jammed. Flew into high ground in cloud six miles SW of Porlock, Somerset. The pilot was killed. Crashed 20 miles south of Horsham St. Faith, Norfolk after loss of control due to a loose tip tank. Flew into a mountain at night in bad weather at Lochnager, six mile SE of Braemar, Aberdeenshire. Both crew were killed. Stalled during a turn while carrying out a supply drop over the jungle in Malaya. It crashed killing the seven crew. Belly landed in error during a night asymmetric landing at Topcliffe, Yorkshire. Burnt out at Sylt, West Germany after simultaneous firing of two starter cartridges. Struck a herd of goats on take off from Atag, Aden damaging the undercarriage. Written off in the subsequent belly landing at Khormaksar. Bounced on landing at Syerston, Nottinghamshire, stalled and crashed. The pilot was instructed to abandon take off from Swinderby, Lincolnshire due to sparks coming from the engine. The pilot raised the undercarriage to stop. Caused by a blanking plate being left in the intake resulting in an overheated engine. The pilot abandoned take off from Wunstorf, West Germany due a fluctuating jet pipe temp gauge. It overshot the runway and struck a railway line causing the undercarriage to collapse. A cowling detached in flight and struck the tailplane. It landed at Celle, West Germany but was written off. Sank back onto the runway on take off from Butterworth, Malaya and overshot into a paddy field. The engine exploded shortly after take off from Jever, West Germany causing the jet pipe to extend six feet out of the fuselage. The pilot ejected but was killed. Swung on landing at Episkopi, Cyprus and ran into a ditch. Belly landed at Sylt, West Germany after the engine failed. Broke formation in cloud at 4,000 feet and dived into the ground west of Alton, Hants. The pilot did not eject and was killed. Flew into the ground at Nicosia, Cyprus during a night approach in bad weather, killing the crew. Flicked inverted after entering an intentional stall with the bomb doors open and the radome fully extended. It entered cloud and emerged under some control but the engines would not respond due to fuel flooding and oiled up ignition system. It passed low over Foolow, Derbyshire and then stalled while in a turn to port. It then struck the ground and caught fire killing the four crew. Flew into the ground in bad weather four miles NNW of West Malling, Kent, killing two of the crew. Stalled avoiding trees after take off from Noble Field, Malaya and crashed. Swung on landing at Kermia, Cyprus and hit an obstruction. Sank into the ground on landing eight miles west of Tanah Rata, Malaya and caught fire. Lost a wheel on landing at Hargeisa, British Somaliland causing the undercarriage to collapse.